I have a confession to make. My friend Joanne who Eats Well With Others might kill me for this, but last night I had a virtual date with her man, Iron Chef Michael Symon. 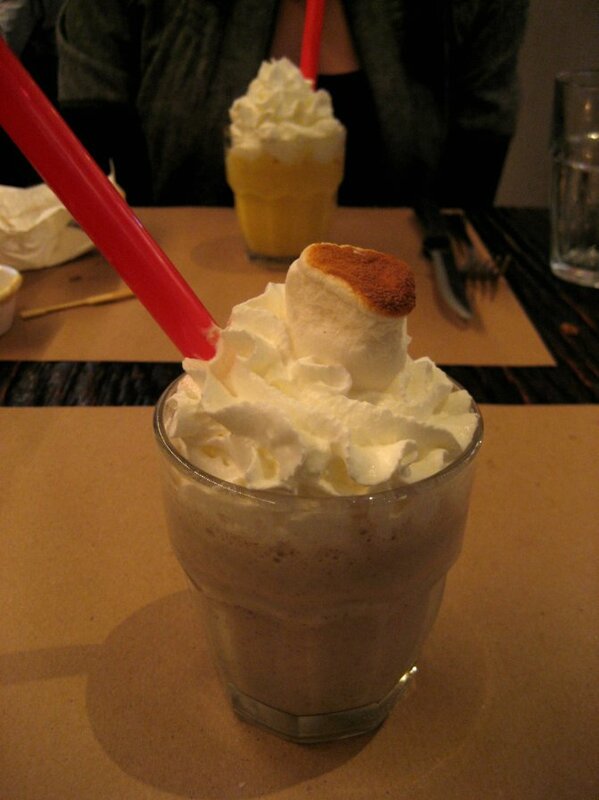 Yeah, we stared into each others eyes over his favorite toasted marshmallow milkshake at Stand. He had 3 of them. And then he had 3 more. And then 3 more after that. See, the clip from Food Network's Best Thing I Ever Ate where Mike (I call him Mike now) was swooning (do Iron Chefs swoon?) 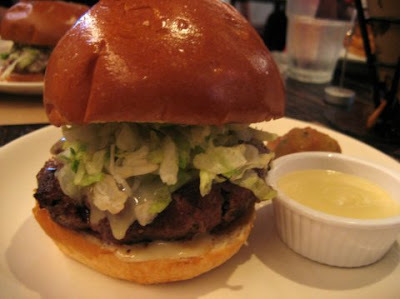 over these milkshakes was playing on repeat in Stand, the "rare well-done burger" spot 2 blocks south of Union Square. I felt like he was personally insisting I order one too, and so I did. After my meal when I could focus all my attention on its awesomeness. 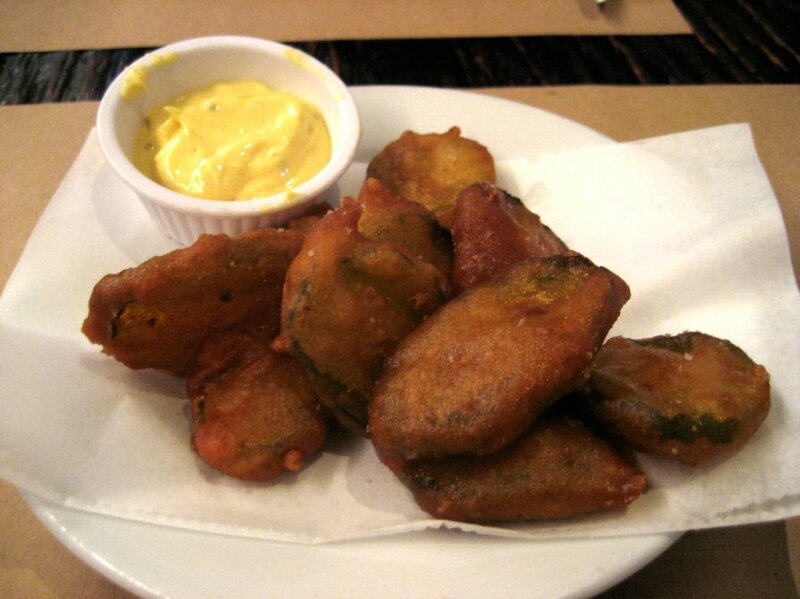 But first we ordered their tempura-battered fried bread and butter pickles. Hello, awesome. These unusual treats were a great mix of sweet-sour from the pickle and salty crunch from the batter. Served with a lightly mustardy, tangy dipping sauce, I personally found them to be pretty irresistable. 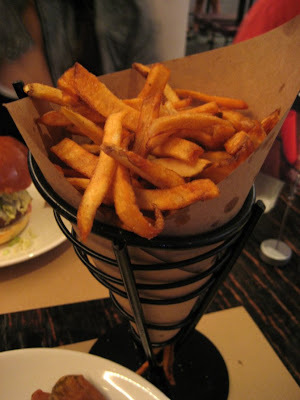 We also shared the battered onion rings and some old-school French fries. The fries were good but not exceptional in the world of mind-blowing fries (those do exist, you know). 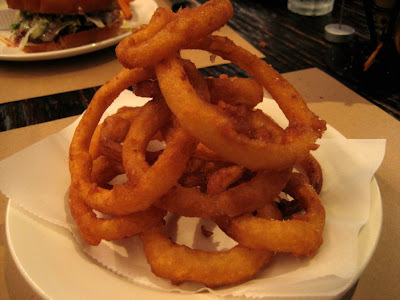 The onion rings were a better choice, I preferred those to the fries, but of course I usually prefer onion rings. They are round and spectacular, like golden halos of fried magic. Perfect accompaniment for a burger. Time for the milkshake! Did it bring all the boys to the yard? Well I can't comment on that, but it was quite magnificent, Mike was right. It tasted exactly like a cold, liquid, toasted marshmallow. We even ate our toasted marshmallow garnishes simultaneously! We're just so funny like that, Mike and I (sorry, Joanne, you can have him back now). The milkshakes would definitely bring me back. They're not cheap, a large is certainly a better deal at $7 as opposed to $5 for the mini, but we were pretty stuffed from dinner. 200th Post and Breslin Review!